8-09-2018: SR 98 will be closed from Sherman St. to Irving St. until storm sewer installation is completed in this area. Tentatively will be paving temporary pavement restoration over these sewer installations from Maple St. to Irving St. by the end of next week. Contractor WILL be working Thursday August 16th (City approved). No work from August 17th-19th due to the Bratwurst Festival. Elite Excavation has begun the long-awaited rebuilding of Plymouth Street which includes new curbs, sidewalks along with storm water and sewer separation. They will be bringing in equipment the week of June 11th and begin construction the week of June 18, 2018. The total project is planned to be completed by October. 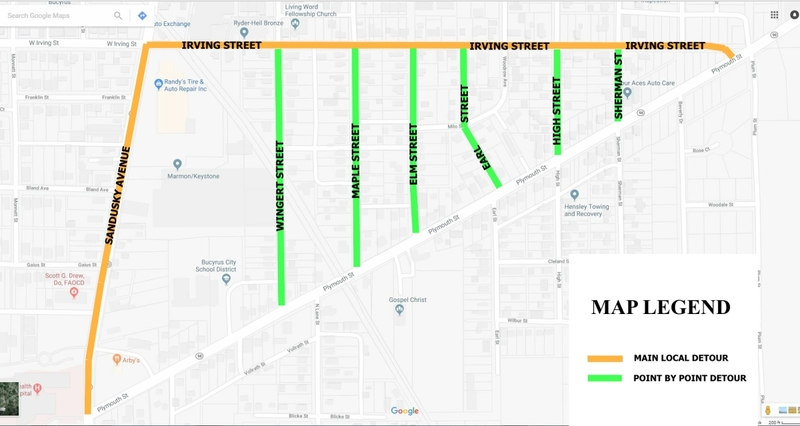 Traffic will be maintained in one direction on Plymouth Street during the construction process and we expect Irving Street to see more traffic because of the restrictions for Plymouth Street. Please be aware that beginning June 18, 2018, on-street parking on East Irving Street will be temporarily eliminated until the Plymouth Street project is finished in the fall. Please make arrangements to park in your driveways or side streets during the project. We apologize for the inconvenience. This will be a bit of a challenge for all of us who live in the Plymouth Street/Irving Street area but it will be worth it! The Plymouth Street reconstruction project will begin the week of June 18th. The project includes new curbs, sidewalks and sewer/storm water separation. The total project is planned to be completed by the end of October. The contractor, Elite Excavation, will be closing the street one block at a time during the installation of the storm sewer lines. The main local detour street will be Irving Street. However, ODOT has suggested local neighborhood detour routes (marked in green) for each point of closure along Plymouth Street. We will update this webpage throughout projects to keep you informed. 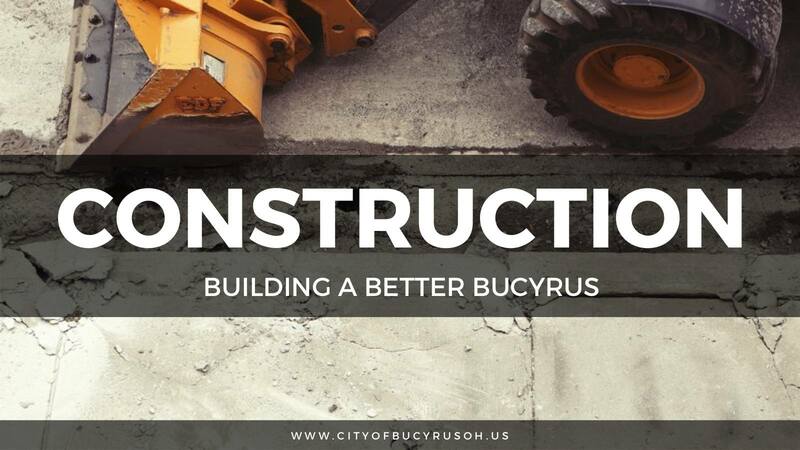 The Bucyrus Engineering Department is here to help you with your development needs. From fences to Subdivisions we are here to help guide you through the development process. This section provides some guidance on when a permit is required; but since every project is unique, the best way to determine if a permit is required is to ask a representative from the Engineering and Zoning Office about your particular project as early in the process as possible. The permit and inspection process is in place to assure everyone’s adherence to minimum standards to safeguard life and limb and property and public welfare and to uphold the design standards of the community. The nearly universal enforcement of recognized building codes in the United States has resulted in a built environment that is among the safest in the world. A permit is required before beginning to construct a house or any building or structure of any kind, or enlarge, alter, repair, remodel, improve, rehabilitate, move, raze, demolish or change the occupancy of a building or structure, or a portion of it. A separate demolition permit is required before demolition of any building or portion thereof. Also, a permit is required for the following items: additions, carports, change of occupancy, commercial construction (i.e. apartments, condos, churches, businesses, restaurants), cooling systems, commercial kitchen exhaust hoods, decks, electrical work, fire alarms, fire suppression systems, garages, interior alterations, manufactured home installations, modular home installations, moving buildings, plumbing, remodeling, roofing (including re-shingling), sewer tap-ins, single family dwellings, storage building (with or without a permanent foundation), swimming pools, and towers. 3. What Work Does Not Require A Permit? Building permits are not required for door replacement, window replacement, spouting and gutters, interior and exterior painting, insulation, sealing of bricks, flooring, repair of decks, porches or steps, and driveway resurfacing. 4.Do I Need A Permit For A Fence? 5. Can I Put My Fence On The Property Line? A fence may be placed on the property line provided you have a written agreement with your neighbor and that agreement is submitted with your permit application to the Engineering & Zoning Office. 6. Do I Need A Permit For A Shed Or Storage Building? 7. Do I Need A Permit For A Patio? Yes, all new structures require a building and a zoning permit. Placement of the patio varies according to the development standards of each zoning district. Please contact the Engineering & Zoning Office for requirements. 8. Do I Need A Permit For A Swimming Pool Or A Hot Tub? Swimming pools, spas, and hot tubs containing water more than 24 inches in depth shall be completely surrounded by a fence or wall at least 48 inches in height with an operable gate and lock. Swimming pools, spas, and hot tubs shall not be located in any front yard. Spas and hot tubs with a lockable cover shall be exempt from the above requirements. All new swimming pools, spas, and hot tubs require a zoning and building permit prior to installation. 9. Do I Need A Permit For A Driveway? New driveway installations require a permit. The driveway cannot be placed closer than three feet to a side property line. The apron material must be constructed of Portland cement from the street to the right-of-way line. The cost for a new driveway permit is two dollars per linear foot as measured along the street. Residential, commercial, and industrial driveways all have specific requirements. Please contact the Engineering & Zoning Office for requirements. 10. Do I Need A Permit For A New Roof? If you are replacing the shingles you only need a building permit. If you are making any structural repairs you need a building and a zoning permit. 11. Do I Need A Permit For A Deck? Yes, all new structures require a building and a zoning permit. Placement of the deck varies according to the development standards of each zoning district. Please contact the Engineering & Zoning Office for requirements. 12.Do I Need A Permit For A Handicap Ramp? Yes, all new structures require a building and a zoning permit. Placement of the handicap ramp varies according to the development standards of each zoning district. Handicap ramps in residential areas, otherwise not in compliance with the zoning regulations, may be approved by the Zoning Inspector in cases of exceptional physical conditions on a case by case basis. 13. How Detailed Do My Drawings Have To Be? For simple projects such as a residential fence or patio, a general site plan showing the project area with lot lines will be sufficient. Larger projects may require full engineered drawings. Please contact the Engineering & Zoning Office for requirements. 14. How Do I Apply For A Permit? Fill out an application and bring your drawings or sketch of your project to the Engineering & Zoning Office during regular business hours for approval. If you need assistance filling out your application, we will be glad help you. 15. How Long Does It Take To Get A Permit? You will be glad to know that most permits are approved the same day as they are submitted provided a registered contractor is used and the project meets the development standards for the zoning district where it is located. Larger projects may take up to 30 days for approval. 16. What Is The Cost Of A Permit? Please go to this link for a list of permit fees. 17. What Happens If I Don’t Get A Permit? Failure to obtain required permits is a misdemeanor and punishable by fines as much as $500.00 per day, every day the violation persists. 18. How Long Is A Permit Valid? Building permits are valid for six months after the date of issue, and zoning permits are valid for one year after the date of issue. 1) The lot must be in a Zoning District that lists single family homes as a permitted use. 2) The Manufactured Home must meet the development standards for the zoning district where it is proposed to be sited. 3) The structure is affixed to a permanent foundation. 4) Connected to appropriate facilities and utilities. 5) The Manufactured home must be at least 900 sq. ft.
6) The manufacture home must be at least 22 feet wide and 22 feet long on one side. 7) The Manufactured home must have a 4:12 roof pitch, conventional residential siding, and a six-inch minimum eave overhang, including appropriate guttering. 8) The Manufactured Home must have been built after January 1, 1995. The Biggert-Waters National Flood Insurance Reform Act of 2012 provides long-term changes to the National Flood Insurance Program. Under the new law, rates are likely to increase overall to reflect the true flood risk of your home or business and many insurance discounts will be eliminated. FEMA has provided this Q&A document for further information. Also, please see this brochure for ways to help manage your risk. The QBS Policy is a qualifications-based selection policy for professional services. Download the Bucyrus QBS policy. The City of Bucyrus has partnered with the Richland County Building Department for commercial building inspections and permitting. While planning for your new commercial development project, check with the Richland County Building Department early for required permits and inspections.